Burks exclusive, unique regenerative type turbine pumps are industry standards. Designed to handle clear water and many other non abrasive, lower viscosity liquids on high pressure/low capacity applications with the greatest possible efficiency. Compact Size also Ideal for OEM Applications. All Bronze Construction also with Monel Impeller Blades. Carbon/Ceramic Shaft Seal especially relevant for Temperatures to 225 °F (107 °C). Close Coupled Design as a result No coupling or alignment problems. Capacitor Start motors have another built-in automatic overload protection. Most noteworthy Furnished with UL Recognized motor lead. Field adjustable impeller for extended service life. Easy to service as a result. Motors have ball/ball bearing construction and furthermore has an open ventilated enclosure. Standard motor as a result is NOT drip-proof. Rated for continuous duty operation consequently, at all ratings shown. 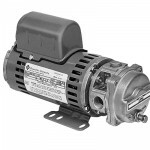 In addition, Drip-Proof motor is available as option for 230 volt.